This band from Birmingham were very well known locally in the early 1960s. Along with Keith Powell’s Valets and Mike Sheridan’s Nightriders, Pat Wayne and The Beachcombers were amongst the city’s top live acts at that time. Patrick Curley was from Ladywood, Birmingham and worked as a waiter at the Grand Hotel on Colmore Row. He changed his name to Pat Wayne in 1957 when he formed a skiffle group called The Deltas with guitarist Dave Husthwaite. had won the BBC Six-Five Special talent contest held for local bands at the Gaumont Cinema. Pat was later able to make an appearance on television which gave him his first real taste of fame. 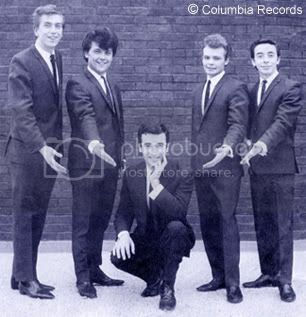 Although Pat Wayne and The Deltas became well known around Birmingham in the late 1950’s and early 60’s, there were various personnel changes including a short appearance by Denny Laine as bass player (see Denny Laine and The Diplomats). Organist Mal Ford who worked at Cadburys, would leave to join Keith Powell’s Valets and soon after, Pat Wayne decided he also wanted a change and left the Deltas to front The Rockin’ Jaymen. The Rockin’ Jaymen had formed in 1957 with the band at that time consisting of Michael Craven (lead singer), Geoff Roberts (lead guitar), Graham? (bass guitar), Fred? (piano), and Jimmy? (drums). The line-up stayed the same until 1962 when a new bass guitarist Mal Edwards joined along with drummer Brian Sharpe (formerly of The Modernaires). Also joining the band were two of the best saxophone players in Birmingham -Dario Capaldi and Monk Finch – who had recently returned from Germany where they had played in Birmingham singer Johnny Neal’s group The Starliners. Pat Wayne and The Jaymen became a popular attraction on the dance circuit and the line up of two saxophone players made for a distinctive image on stage and gave the band a trademark sound. In June of 1963 following in the wake of the “Mersey Sound” craze, Birmingham was visited by Cliff Richard & The Shadows producer Norrie Paramore who was looking to sign up new talent for Columbia Records. Auditions were held at the Moat House Club in Digbeth and Pat Wayne with The Rockin’ Jaymen were one of the first bands to be signed. They were soon sent down to the famous Abbey Road studios in London where they recorded a number of tracks under direction of Norrie Paramore. Before the band’s first single could be released, the record company decided that the name Rockin’ Jaymen might be confused with Peter Jay and The Jaywalkers, a group from East Anglia. and writing hits for Kathy Kirby, the Merseybeats, and having his own hit records in the 1970s under the name of Daniel Boone). Note: there was also a London band called The Beachcombers whose line-up included future Who drummer Keith Moon. A highly danceable track titled Go Back To Daddy, composed by Birmingham songwriters John Chesterton and Bob McNally, was chosen as the A-side for the first Pat Wayne and The Beachcombers single. Perhaps even more remarkable was the B-side which was a rocked-up version of the Hank Williams classic Jambalaya, and it must surely be one of the best dance versions of the song ever recorded. “We did many takes of Jambalaya” says guitarist Geoff Roberts. “It nearly drove us mad… and it got faster and faster”. The single was released in 1963 and credited to Pat Wayne with The Beachcombers. The Beachcombers also had their own single without Pat Wayne released in October 1963; a high-energy, saxophone-heavy instrumental entitled Mad Goose. The 45’s sold well locally and gave the Beachcombers exposure on TV and radio despite not reaching the record charts. In November of 1963, Pat Wayne and The Beachcombers went back to Abbey Road to record a version of Chuck Berry’s Roll Over Beethoven. It has long been thought that future Led Zeppelin guitarist Jimmy Page was hired to play lead guitar on the recording but according to Geoff Roberts this was not the case. “Jimmy Page never had anything to do with the band” says Geoff. the second track slightly out of tune with the first which gave the recording a distinctive sound. We actually recorded it before the Beatles and if you listen to their version there are similarities but they also used the same studio and probably the same engineers so its not surprising”. Although the single was released before the Beatles version and apparently sold more than eighty thousand copies, it was unable to get into the charts. By coincidence Roll Over Beethoven became one of the first big hits for Birmingham group The Electric Light Orchestra in the early 1970s (see The Move). Geoff Roberts left the Beachcombers in 1964 and was replaced by Tony Carter. Pat Wayne and The Beachcombers recorded another Chuck Berry song called Bye Bye Johnny that was released as a single in April of 1964 but it unfortunately also failed to chart. and were replaced with new members. After the release of a final single with the Beachcombers, Pat Wayne decided to go solo and went on to record a further three singles in 1965 and 1966. The songs were well produced and should have done well, but by this time the record charts were dominated by “pop groups” and apart from isolated successes by those such as Tom Jones and Engelbert Humperdinck, solo performers seemed no longer in fashion. by the departure of their saxophone players. By 1966, Pat Wayne’s solo recording career appeared to be foundering as EMI had not renewed his contract. He re-joined The Beachcombers who by then consisted of remaining original members Mal Edwards and Brian Sharpe along with Eric Ashcroft as their guitarist. Brian Sharpe also decided to leave. who had previously played in The Senators and with Nicky James. The Beachcombers and he ended up drowning out the rest of the band on-stage with his volume! After a number of bookings John made an amiable departure from Pat Wayne and The Beachcombers who by now found their engagements increasingly scarce. He joined another local group called The Way Of Life but it would still be a few more years before he became part of Led Zeppelin – one of the most successful rock bands of all time! line-up before they folded for good in 1967. Saxophonist Monk Finch went on to join Locomotive and Geoff Roberts continued with various other bands until 1968. In 1995, Geoff got back into music and played bass guitar in a band called 4-Play and in 1999 toured the U.K. and Europe with a band called Bullitproof. These days he plays bass in a modern country-rock band. Pat Wayne – a true legend of the Brum Beat scene – continues to perform around Birmingham occasionally to this day. for assistance in writing this biography. Brian’s daughter. Please send me anything. I have alot of Dads history if interested. We came to Australia as 10 pounders in 1968. He kept playing music but dont think he enjoyed it as much as in Brum. Someone please give me a couple of colourful stories. I was 2RO when we came to Oz. Knew your Dad as a giant leg puller with a big heart in the right place. Contact me if still interested and I will tell you about a tour of Germany and how he helped me join the Beachcombers. Keith Moon never had anything to do with this Birmingham band. I was an original member of the Rockin Jaymen mentioned as Fred ? In your archive. My wife found this page for me after I mentioned that you had played with The Beachcombers it would be great if you could get in touch.